Second digging site of the three-day trip – in central Washington. 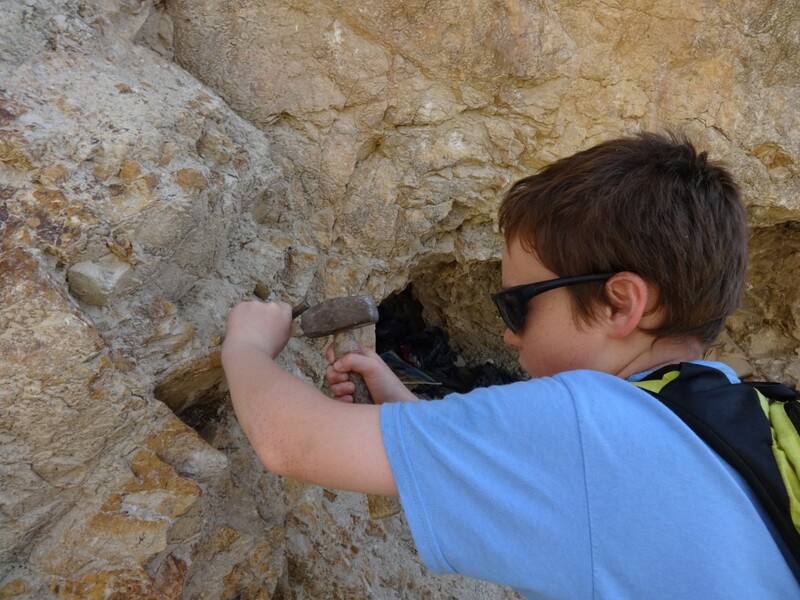 Looking for dessicated opal! We hauled in a BIG one…check the album for all the pictures. 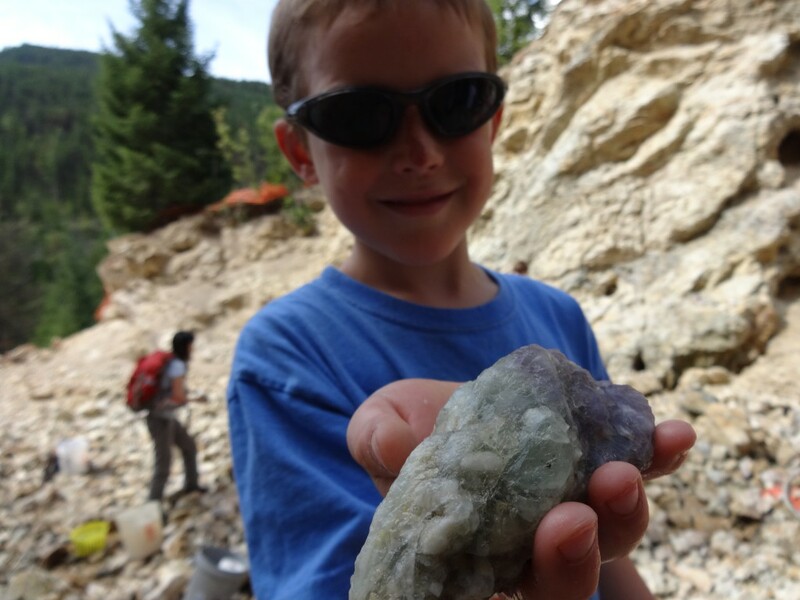 Chiseling out fluorite geodes at the Rock Candy Mine in British Columbia, owned by our guide, Bob Jackson. He led an awesome trip! Boys were so excited the whole time despite long days and drives. 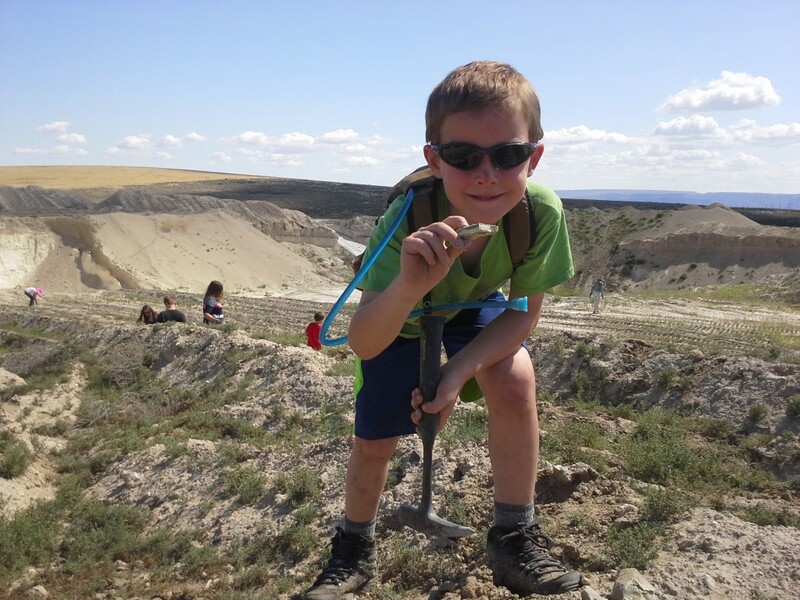 Ben loved digging up big fluorite crystals. 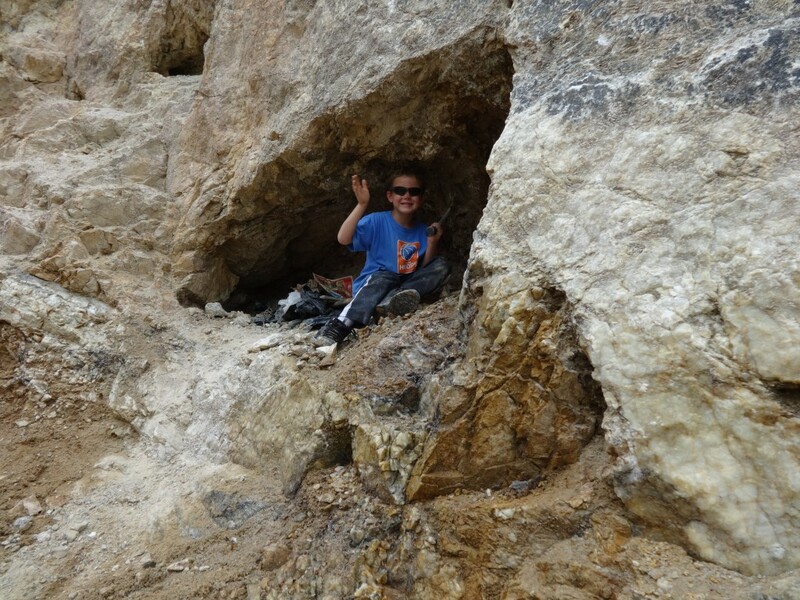 Both boys in a vug looking for rare barite crystals! In a little vug working together for a long time! 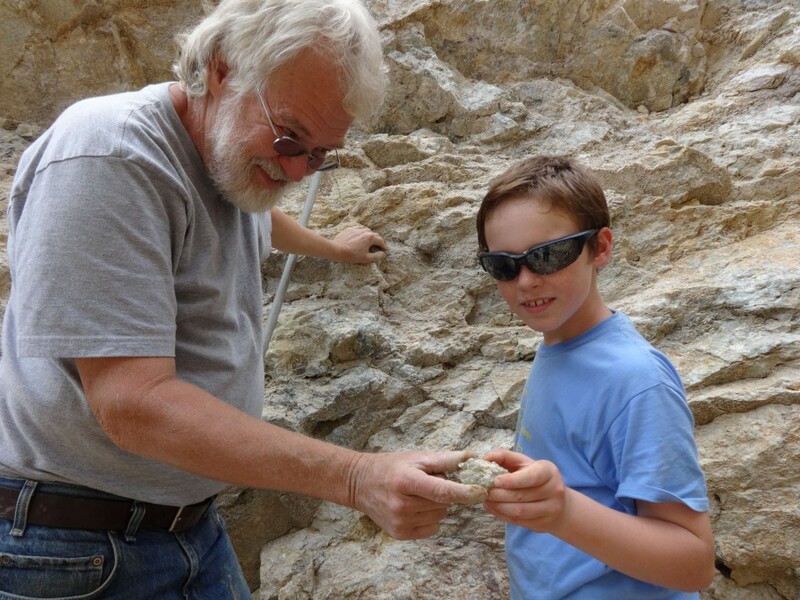 Sam captured a great fluorite octahedron with Bob as mentor! Cream Soda Crew strikes again! Last weekend I noticed a flyer up in town regarding Project Backpack. We support the charity, which provides school supplies for families in need, through donations ($) but I thought they MUST be doing a lot of sorting right about now to get all those supplies handed out. It occurred to me it would be a great job for the Cream Soda Crew! A way to help other students and continue working together as a crew. I called Helpline House and left a message, something like…I have a crew of young boys who are experts at demolishing odd jobs. I explained the inception of the crew as a charitable endeavor in support of their school auction – they got their start doing spring yard cleanup. I hung up and wondered if I would hear back. I did!! While initially they were a little doubtful about 5-6 boys coming down and sorting/labeling supplies, they decided to give us a chance. (I understand – most of the jobs are outside, but I know they can handle inside work, too, thanks to Sara putting them to work at the courthouse!) 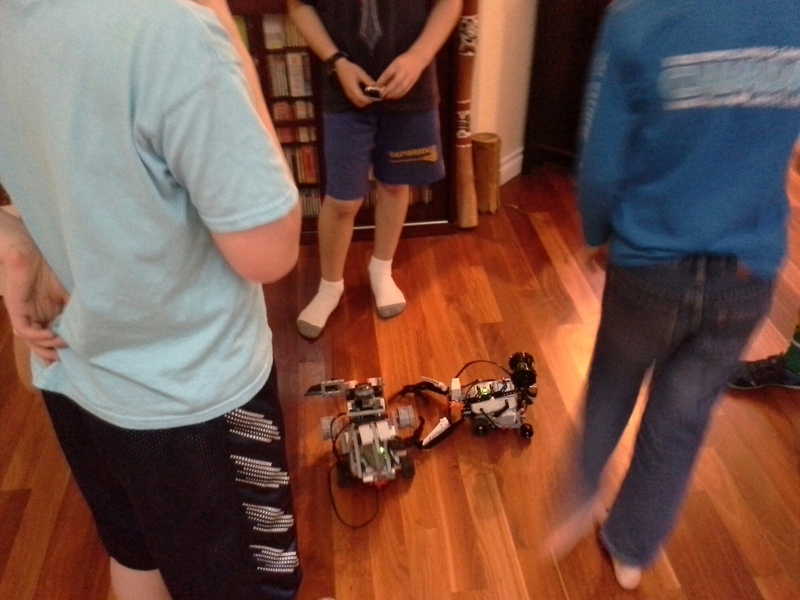 Well, after we got the ok, more kids joined the crew. 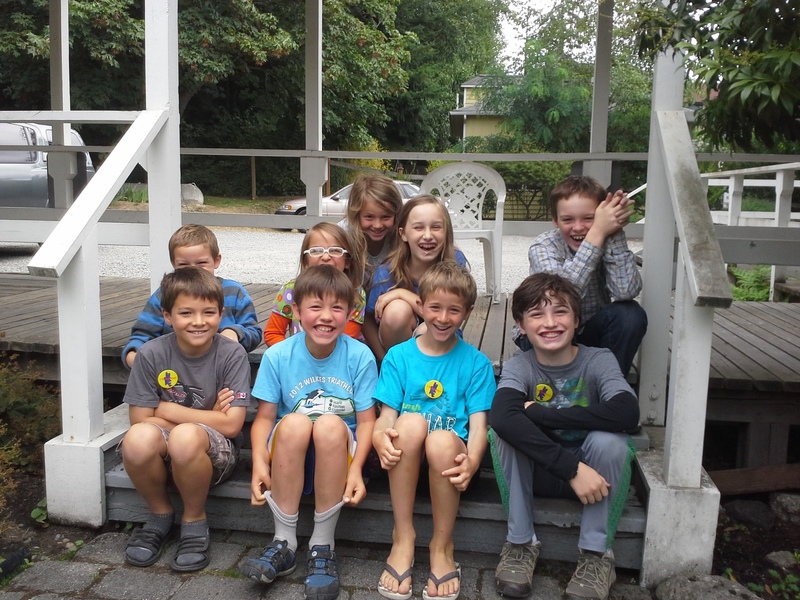 In the end we had 9 kids – 6 boys and 3 girls – grades 1 through 5! What a team! Take a look at what they did in just one hour! 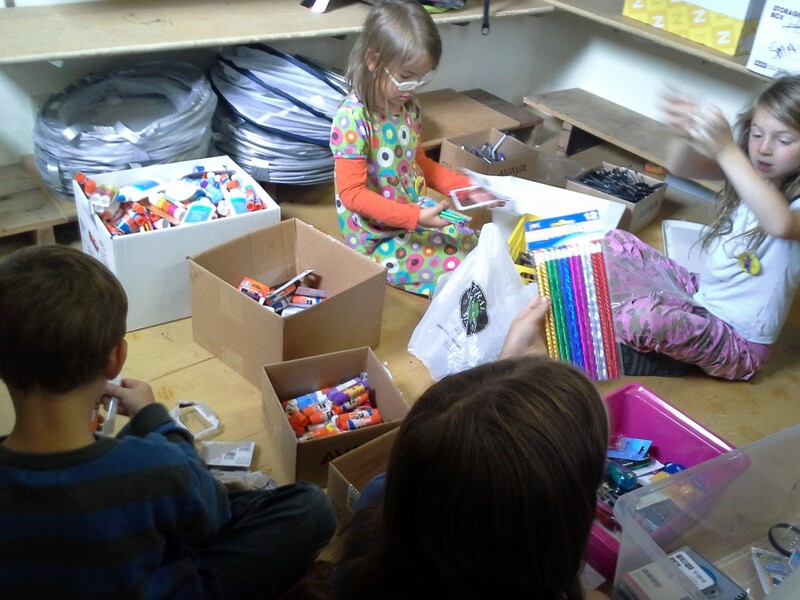 The teenagers volunteering today don’t need to do all the sorting – they just hand out supplies! Way to go, Cream Soda Crew! We had a good time at the after-party at our house. 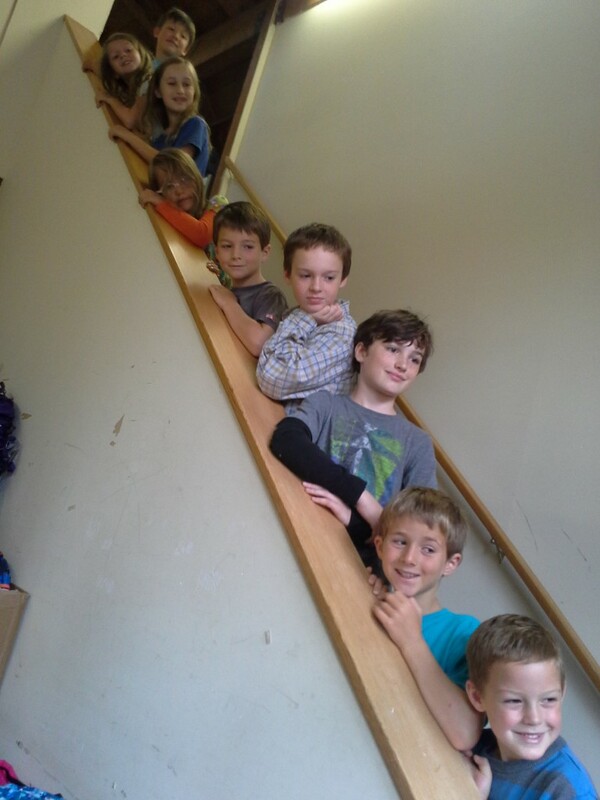 This was my crew – we worked on bundling up glue sticks into groups of 4. 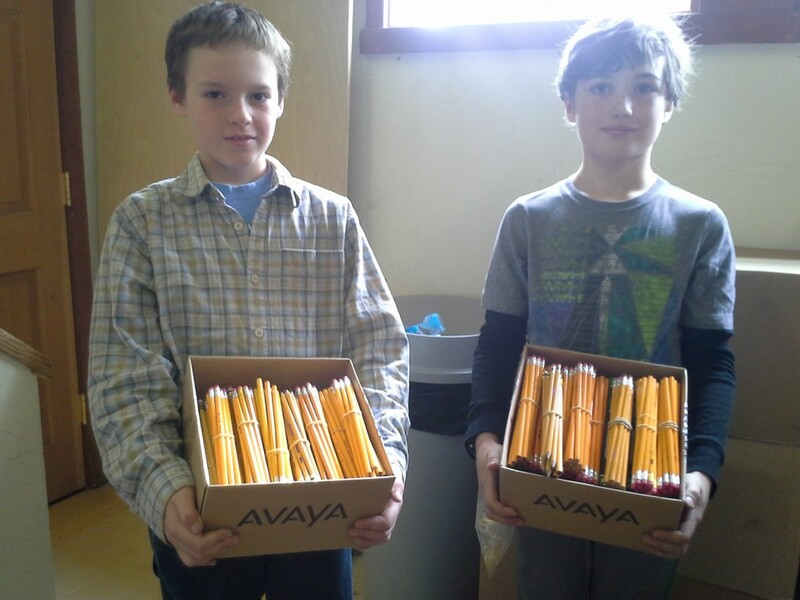 We also sorted pens, pencils and other supplies. 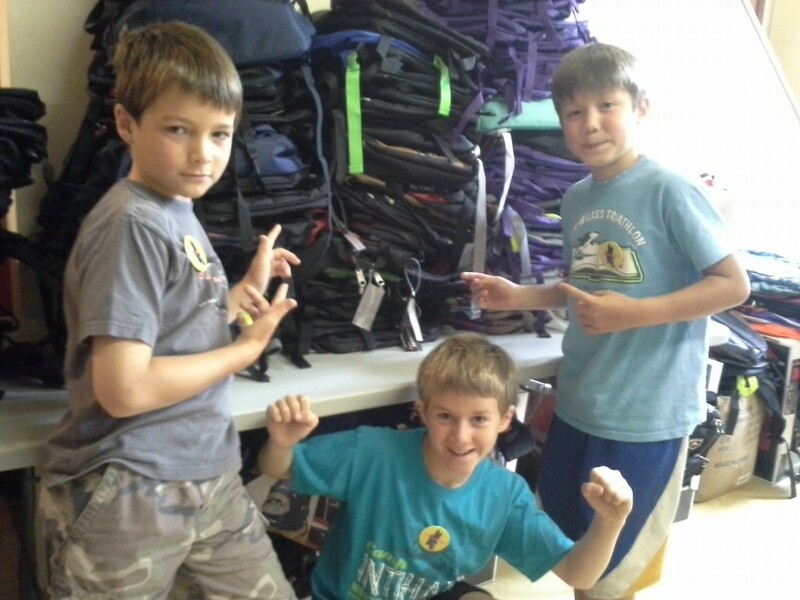 Backpack unpacking, sorting and stacking crew! 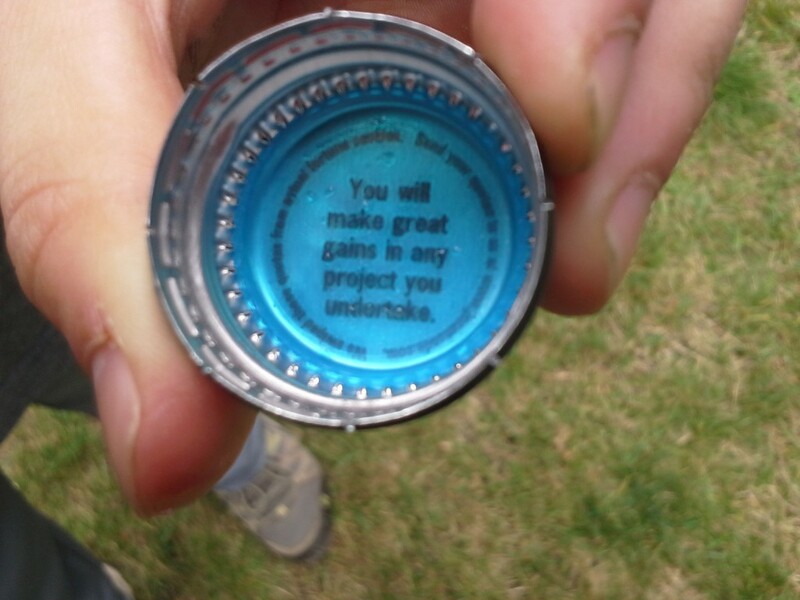 Cream soda rewards afterwards – look what this bottle cap says! If you are interested in what my dressage training is all about, here are a couple videos (and if you go to the channel, you can see more). Emmy is the spirited Irish Cob I am “borrowing” from Steve and Theresa just down the road from Janet’s Whitethorn Farm where I train. Theresa filmed the clinic with guest instructor Bill Woods for me so I could watch it again. Today I finally summoned the noogies to watch – I truly hate my lower leg position but since we continue to work on canter departs I decided to ignore the leg and take in the instruction once again! I’m also including a video from November 18, 2013 so you can see the progression over 10 months. 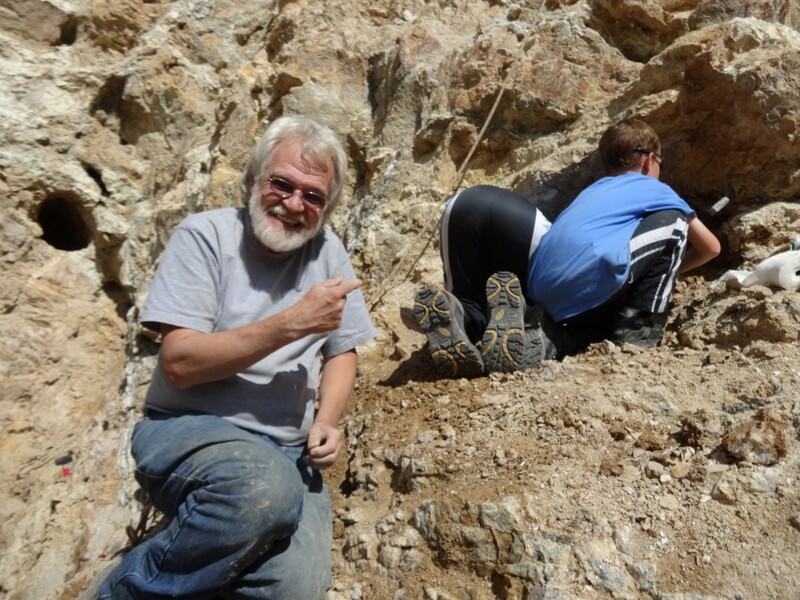 Much work remains, but I can see progress, and I am noting how patient my instructors are. Geez it takes a long time to retrain the body! I am very grateful to have an opportunity to work with Janet after 26 years out of the saddle. I’ve been riding twice a week for the last 7 months and have only missed two rides this summer thanks to a steady stream of great high schoolers who have been able to hang out with the boys and other neighborhood kids. I can’t recommend Janet Grunbok highly enough. As Steve says, the progress to date compared to where I started is night and day! 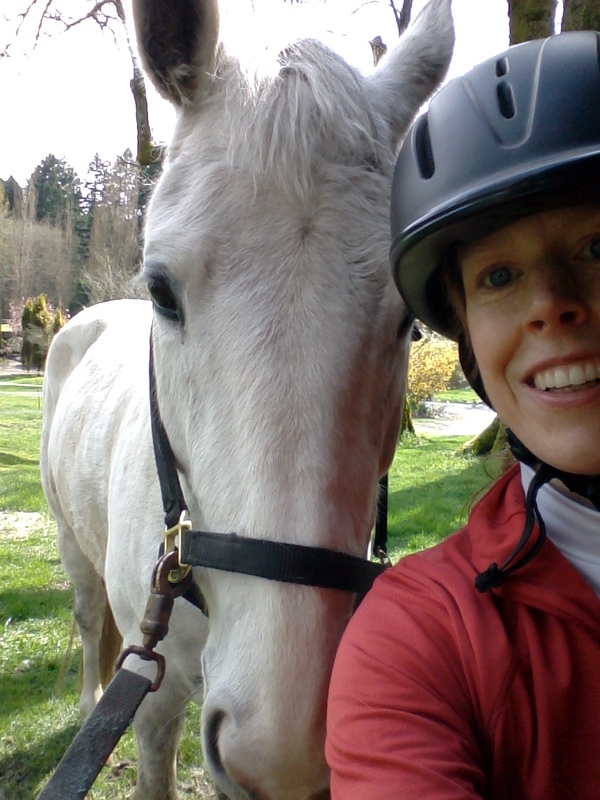 If you want an excellent instructor on Bainbridge Island, look no further. Janet is the consummate professional, always reading, thinking, seeking additional training for herself, and furthering her students’ understanding of dressage with selected readings from the web and dressage publications. Her lessons are focused and build on the fundamentals. Each time I come away exhilarated and with a goal to work on between lessons. I sure wish I’d known Janet when I was 8 years old and starting to ride my first pony! First lesson with Janet! I was on the longe line until February while we worked on balance, among myriad other things. You learn a lot just hanging out with Janet in the barn! 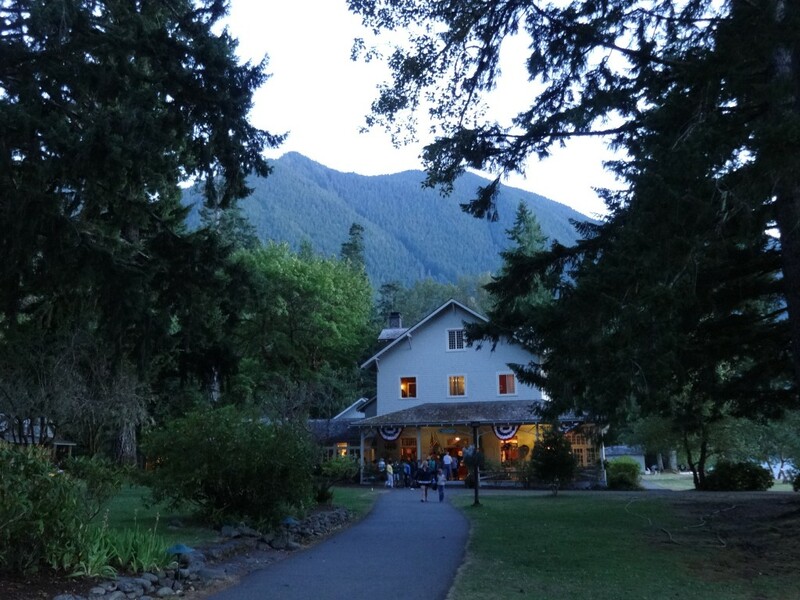 In August we popped out to the Olympic Peninsula several times to check out adventures we hadn’t gotten to yet. 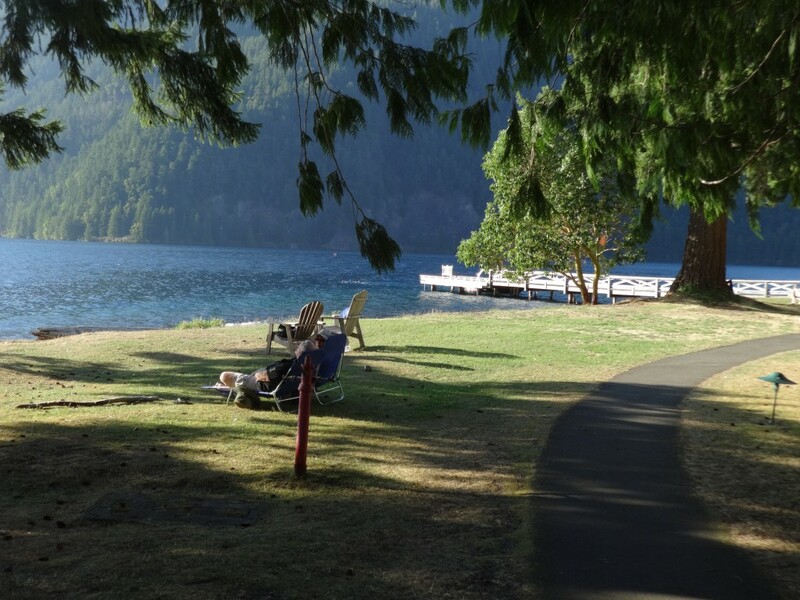 We were very fortunate to grab a room both at Kalaloch Lodge on the coast and Lake Crescent one weekend. 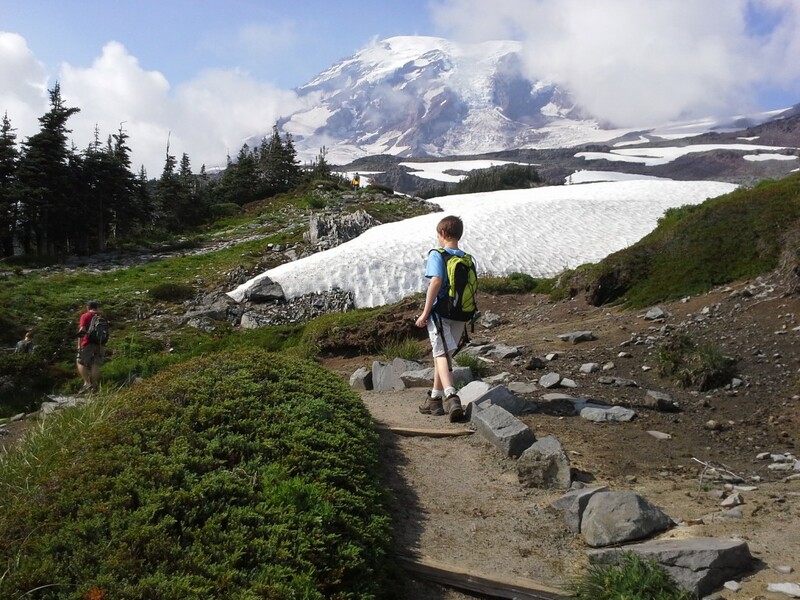 We also made it to Rainier for PEAK WILDFLOWER VIEWING! Can you believe it? 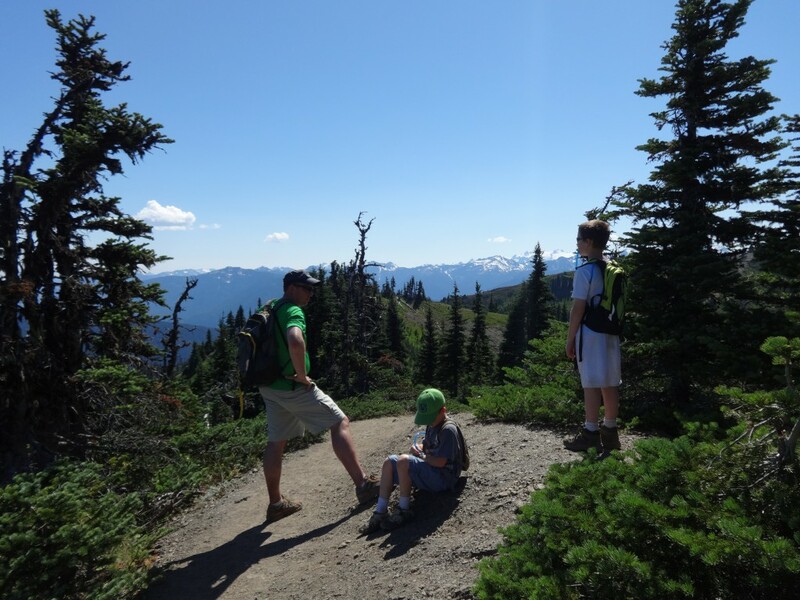 That was an epic day – 7 hrs of driving and 3.5 hrs of hiking! We sure did have fun! Please check the album link above for August pictures. 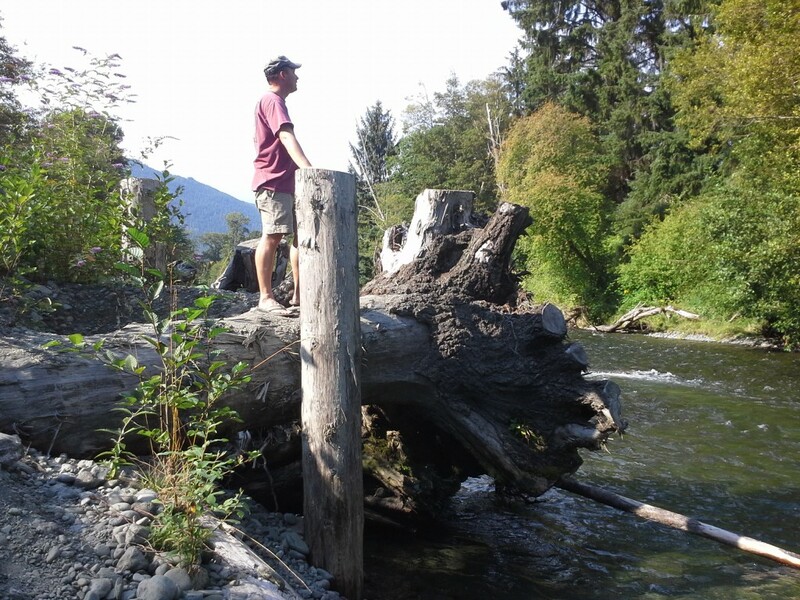 Dave at the Dosewallups River on a peaceful afternoon following a great hike on the Steam Donkey trail. 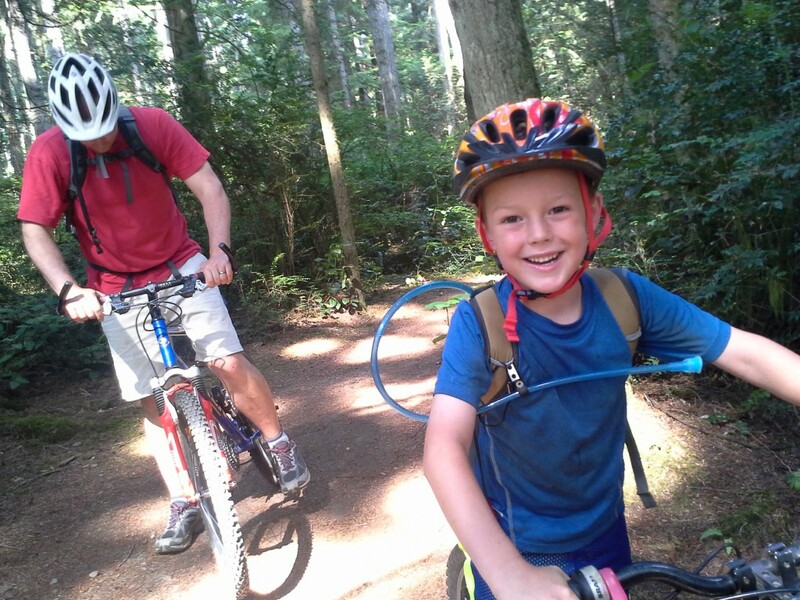 More mountain biking at Grand Forest! Ben is certified by Dave as a competent mountain biker, handling all of the trails, including steep, gravelly slopes and single track, with skill. Good for you, Ben! Blackberry bear! 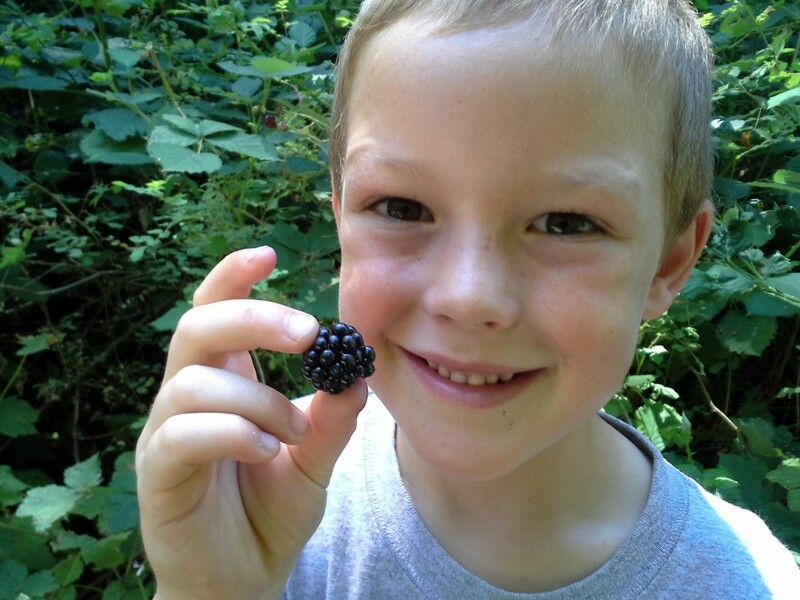 He stops for berries of all kinds! 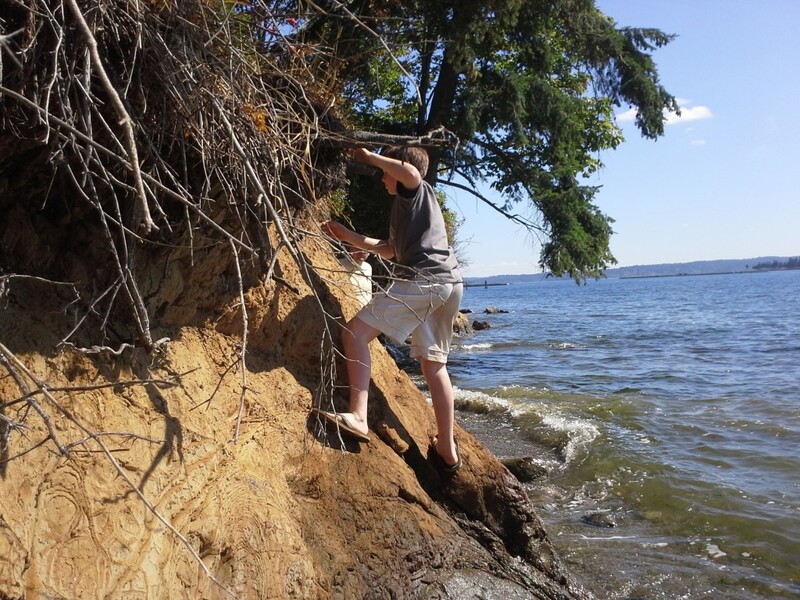 Some impromptu climbing that reminds me of Hawaii adventures. You don’t go far, but you go deep and explore things at the micro level that you never would have thought to stop by and check out otherwise. Sometimes we mainlanders feel like we have to strike out ambitiously to have a good time. We don’t. 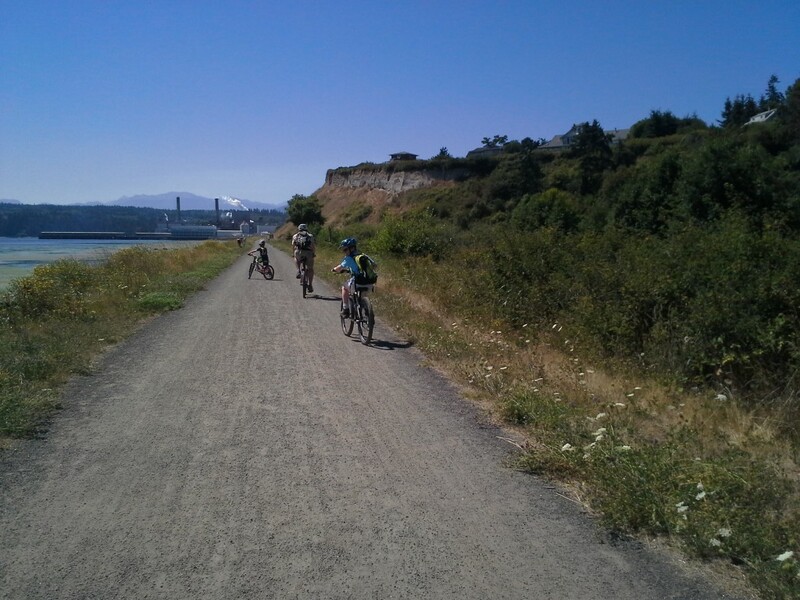 Olympic Discovery Trail from Port Townsend. You bike 7.5 each way through many great trails and farms. Hard to decide which of these bike trails I like the most! Hurricane Ridge rest stop on our way to Kalaloch. 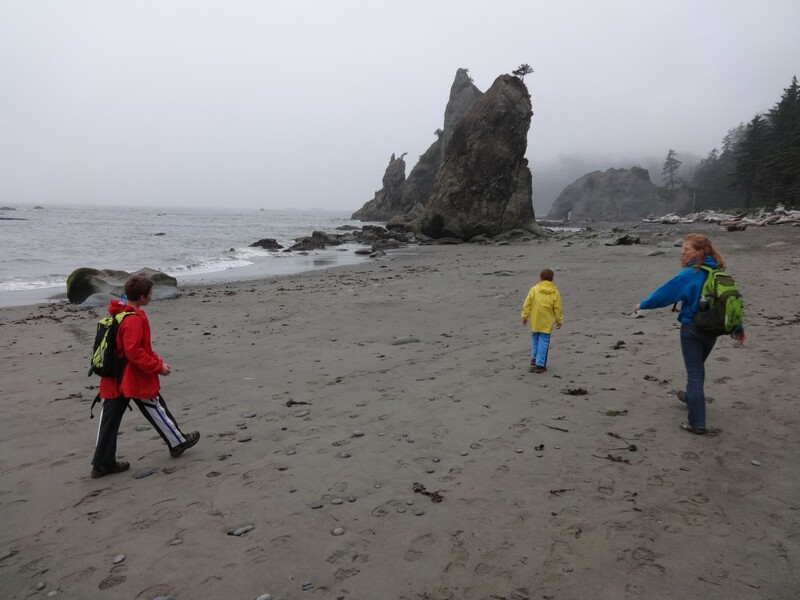 Rialto Beach walk to Hole-in-the-Wall. I love the lodge at night. We are listening to a very funny and informative ranger presentation on the porch. 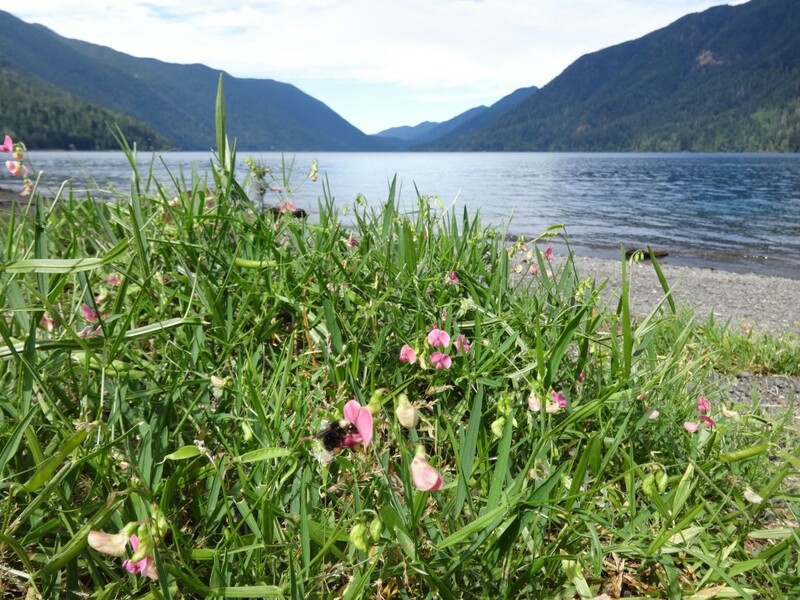 Wild sweet peas on our little lawn overlooking the lake. 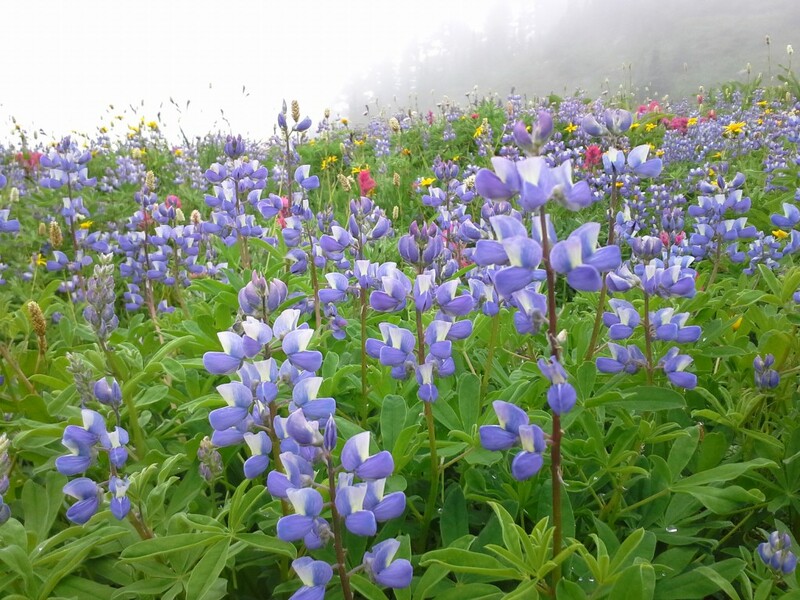 Wildflowers!! And marmots! OH MY! Check the album!